The FTW Transcriber’s bookmarking feature enables you to set as many bookmarks as you like in a recording, and access them quickly. There are two ways to add a bookmark. While playing a recording, you can either click the “Add Bookmark” button on the FTW Transcriber’s interface, or you can use the hotkey, which is CTRL-Q. To view your bookmarks, click the “Bookmarks” button on the interface. The numbering of bookmarks is dynamic, and is always numbered consecutively from 1 upwards, no matter how many bookmarks you add or delete. To jump straight to a bookmark, simply double-click on it. To add a description for a bookmark, or to edit an existing description, click once in the Description field. 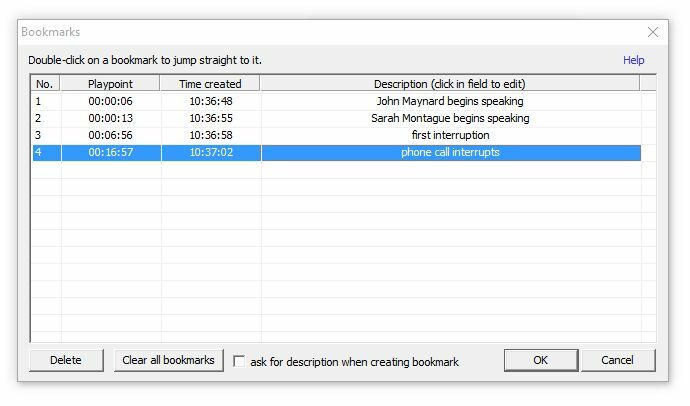 To prompt the FTW Transcriber to ask you for a description each time you add a bookmark, check the box marked “ask for description when creating bookmark”, then click OK.
To delete a bookmark, select it then click Delete.